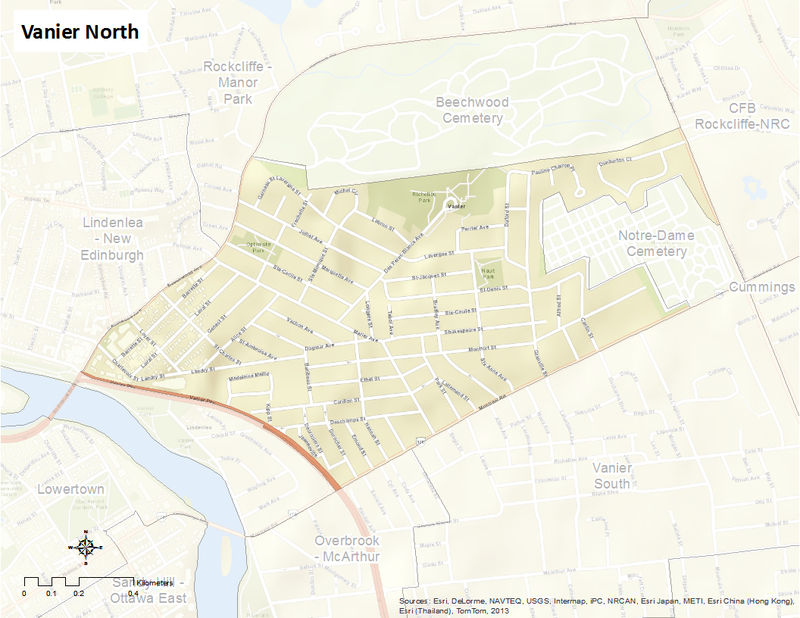 Vanier North is bounded by Beechwood-Hemlock-Beechwood Cemetery on the north, Montreal Road on the south, the Notre-Dame-de-Lourdes Cemetery on the east, and the Vanier Parkway to the west. Here’s an infographic that describes the neighbourhood as a Village of 100 (2011 data). In 1908, the communities of Janeville, Clarkstown and Clandeboye amalgamated to form the village of Eastview. The village was then designated a town in 1913, and later a city in 1963. In 1969 it was renamed Vanier in honor of former francophone Governor General Georges Etienne Vanier; this was done in the spirit of acknowledging the city’s significant francophone population. Despite being described as ‘the poor cousin’ of the surrounding neighbourhoods (such as Rockliffe Park, New Edinburgh, Lindenlea and Sandy Hill), it remains a proud community where many of the francophone residents are able to trace their family histories to the area’s early days as a hub for civil servants during the late nineteenth century.